Meters with the capability of issuing printed bills would be compulsory from August 1, the National Council for Road Safety (NCRF) said. 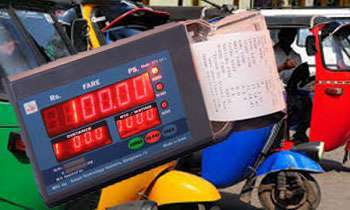 NCRF Chairman Dr Sisira Kodagoda told the Daily Mirror that all three-wheelers used for passenger transport should have meters. “After August 1, the regulation would be strictly implemented and stern legal action will be taken against the passenger transport three-wheelers for not having fare meters,” he said. He said they should issue printed bills to passengers indicating the distance, fare, charge per kilometre, taxi and the driver details. “The Traffic Police had been instructed to book the three-wheelers which do not comply with the regulation,” he said. “Spot fine is not allowed anymore and fine will be decided after producing the three-wheeler driver in court,” Mr Kodagoda said. He the taxi-meters was also being manufactured according to SLS standards. “We cannot interfere with the manufacturing process but the meters should be made according to the given specifications,” Dr Kodagoda said. In addition the Government should implement a requirement for all three wheels, buses including vans transporting students and people, trucks and lorries to have speed control devices installed to control their speed at a maximum level which would be the speed allowed in a particular road. Very good. Often three wheeler drivers in outstations quote arbitrary fares, especially to foreigners and those unfamiliar with the area. Try implementing? The goons outside a popular mall at Lipton circus wanted 300/- to go to a hotel 1.5 km. Waited for 15 mins got an AC car (not mini) and the fare was only 230/- . Stop 3 wheelers. No other solution. In Kandy a three wheeler charged me Rs.150.00 from Kandy lake close to Dhalatha maligawa to Railway station. May be one km maximum. A nice walk of 1 km would be good, one in away. Not to mention the Kandy three wheel drivers will feel the pinch soon. Pickme and Uber are reaching Kandy. We can't expect that three wheel drivers will adhere to any law. Same as bus drivers and conductors. In Colombo, services like Uber and PickMe have already beaten unfair charging. But in outstations, three wheel drivers are worst. If they oppose, we should remove scales from grocery shops too. Hahahahahaaa .......... What a big joke ? Believe it or not, one crook charged me Rs 3000 to go from Thalawathugoda to Maharagama. My mistake was I only asked for the damage when i reached Maharagama. Not realizing $/Rs I thought he was a jovial guy and gave him a 300 Rs tip. Then he said for another 10K he could set be up with a pretty girl. Adding salt to insult when I came home and told my GF she was on the ground rolling and laughing. Has the minister woken from his deep slumber? Very good. Without proper rules and regulations the country will whither away.Looks like Yahapalana wheels have started moving even at a slow pace.